The return of Billy Boy Arnold as a major figure in blues remains cause for celebration. Excellent work for Bruce Iglauer's Alligator label put him in some steady company and he came through like the knockout he has always been. This new disc from the Canadian imprint, Stony Plain, pairs Arnold with some of New England's finest blues players; Duke Robillard and his band, and he recaptures some of the magic he's known for. A fine songwriter with much to his credit, Arnold takes the writing chores on only six of the dozen tracks which is perhaps a minor complaint. The cuts from his pen crackle and cook as well as anything he's done and feature stellar harmonica while the other half-dozen tracks seem to pull back the reins a bit too much. As a vocalist with a dry, laconic style he has always managed to write catering to these qualities. The pair of gems from Ray Charles, one by Otis Blackwell, and two from Jimmy McCracklin add spark but fall just short of igniting all cylinders in the engine compartment. Kicking off with a pair of originals, "Bad Luck Blues" and "Let's Work It Out," Arnold delivers with plenty of top-shelf, gritty harmonica to please those familiar with his earlier efforts. McCracklin's classy "Just Got To Know" works well but pleads for a belting vocal like Magic Sam's on the 'live' Delmark set. The cut features some great sax work from Gordon Beadle and Doug James and ripping guitar from Duke while the vocals hold it back from being a hands down stormer. "Greenville," penned by Arnold, is a smoldering up-tempo groove with more fatmouth harp and the band driving things along anchored by Jeff McCallister and John Packer on drums and bass respectively. "Hello Stranger" is another fine original while Otis Blackwell's "Home In Your Heart" seems to lack a distinct direction. It doesn't fit Arnold as well as the meaty shuffles or slow, gripping blues he sounds more at home with. Ray Charles gets author's credit, first with the slow, brooding "Blackjack" which stands well and on the closer, "Greenback," a sizzling horn cut. Everyone plays with feeling and the vocals are workmanlike but with Arnold able to craft excellence when he sits down to write, it does tend to pull the focus away from where it should be. The title cut is a stomping original with a Jimmy Reed feel and "Come Here Baby" is also strong. "Every Night, Every Day" is another Jimmy McCracklin chestnut and holds tight as does the funky Leon Haywood cut, "Just Your Fool." The bonus is the 17 minute interview which closes the disc with Billy Boy Arnold talking about his early days, visits with the original Sonny Boy Williamson, the Chess and Vee-Jay era, Bo Diddley, and much more. This is an area that remains mostly untapped; blues legends with a lot to speak on reminiscing about their influences, friends, and recording history in an interview setting on CD. We're fortunate to have the written interviews available in magazines and books but there's something extra in hearing a Chicago blues legend talk of days gone by. 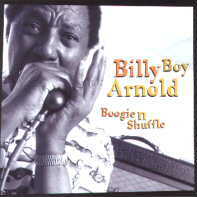 All in all, there is much to be thankful for here and Billy Boy Arnold continues to disguise his age when he rips out the harmonicas and lets loose. While he is capable of covering diamonds from the likes of Ray Charles and Jimmy McCracklin, he simply sounds more at home when he lets himself do the work as a gutsy songwriter. Perhaps it's a preference for more greasy harp work and the tough Chicago blues he's known for, perhaps it's the sense of 'real life' captured by Arnold when he writes. I would welcome this lineup again since Robillard's pedigree as producer and player has brought a lot to the table over the years but next time laying focus squarely on the matter at hand; a great songwriter and muscular harp player with plenty left in his bag of tricks. Email is info@stonyplainrecords.com if you have questions.